Aikido, ‘the way of harmony’, is a non-competitive martial art emphasizing the unity of mind and body. It is primarily defensive, and most of the practice consists of partner practice with a focus on neutralizing an attack by joining and redirecting the offensive force. Our club practices Aikikai, the original Aikido school and is affiliated with the Canadian Aikido Federation. We practice Monday nights, 7 – 9pm, (except holidays) at Parkallen Community Hall, 11104-65 Avenue. In addition, Sunday jo and bokken training happens, 3 – 5pm, (except as part of a long weekend) from the month of May at the Edmonton Japanese Community Association, 6750 88 St NW, Edmonton, AB T6E 5H6. Children under 12 must be accompanied by a practicing adult. Guests are welcome! Please contact us to confirm your visit. 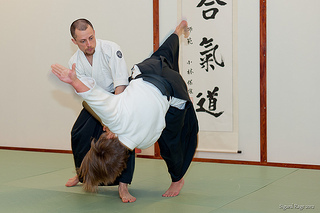 Membership is $25 per year for registration with the Canadian Aikido Federation. Annual mat fee is $250 or drop-in rate of $10 per class.